Kubota’s newest engine, the D902-T-E4, proves it’s possible to pack a lot of power into a compact premium package. The D902-T-E4 made its debut October 17 at the 2018 Green Industry and Equipment Expo (GIE) in Louisville, Kentucky. The D902-T-E4 is far lighter and more compact than comparable engines, offering an output of 18.5 kW at 2800 rpm and a maximum torque of 78 Nm at 2000 rpm. This light-weight, high-torque engine is designed for use in the turf industry as well as applications including utility vehicles, mini excavators, mini-track loaders, trenchers and welders. The high torque with the lower RPM produces minimal noise, making it an ideal option for the turf industry. The addition of a turbo-charger makes it a versatile and powerful engine especially useful for applications at high altitudes. 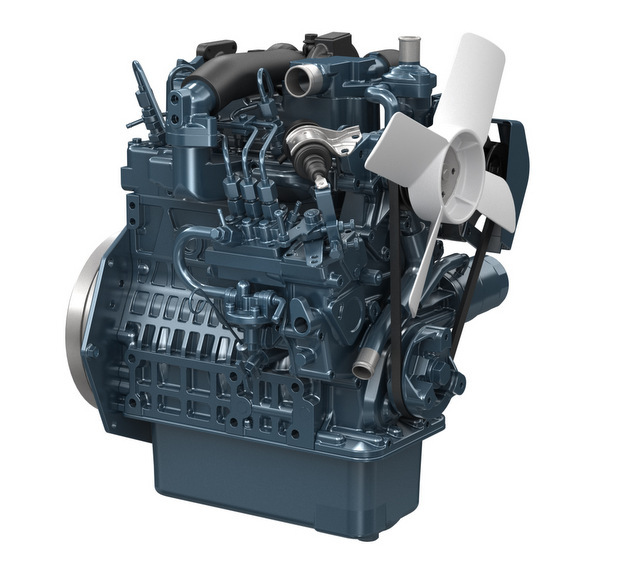 The D902-T-E4 has the same engine footprint as its counterpart, the naturally aspirated D902-E4 mechanical engine. Like the D902-E4, the D902-T-E4 also has a mechanical fuel injection system, so it fits right into its family of Kubota Super Minis. The engine complies with U.S. EPA Tier 4 Final and EU Stage V.
For more info on Kubota, just click this link. It’s very clickable.